It turns out that geomagnetic storms are caused by cataclysms on the sun, which fling magnetically charged matter toward earth. The collisions can rattle earth’s magnetic field, sending power surges through electrical grids. The high-speed particles can also take out satellites critical for communication and navigation. The main fear is that an extreme storm would so damage electrical grids as to black out power on a continental scale for months, even years. The toll of such a disaster would be tallied in economic terms, presumably in the trillions of dollars. It would also be measured in lives lost, since all the essential infrastructure of civilization, from food transport to law enforcement, now depends on being able to plug things in and turn them on (NRC 2008, pp. 11–12). Having examined the issue, especially its statistical aspects, I am not convinced that this scenario is as likely as some prominent voices have suggested. For example, as I will explain in a later post, Riley’s (2012) oft-cited estimate that an extreme storm—stronger than any since the advent of the modern grid—has a 12%-per-decade probability looks like an unrepresentative extrapolation from the historical record. I put the odds lower. My full report has just been posted, along with data, code, and spreadsheets. Nevertheless, my reassurance is layered in uncertainty. The historical scientific record is short–we get a big storm about once a decade, and good data have only been collected for 30–150 years depending on the indicator. Scientific understanding of solar dynamics is limited. Likewise for the response of grids to storms. My understanding of the state of knowledge is itself limited. On balance, significant “tail risk”—of events extreme enough to cause great suffering—should not be ruled out. This is why I think the geomagnetic storm risk, even if overestimated by some, deserves more attention from governments than it is receiving. To date, the attention has been minimal relative to the stakes. A distinctive feature of the geomagnetic storm issue is the sequential, probabilistic nature of the phenomenon of concern. The storms originate in cataclysmic explosions on the face of the sun with the power of a billion hydrogen bombs. Each event may throw off some amount of magnetically charged plasma—from tens of megatons to tens of gigatons (Gopalswamy 2006, p. 244). In the abstract, this coronal mass ejection (CME) has some probability of hitting the earth, which depends on the CME’s angular breadth. If the CME hits, it will do so at some speed, perhaps as high as 1% of the speed of light, 3,000 kilometers per second. The CME’s magnetic field may by chance point substantially in the same direction as the earth’s, producing a magnetic collision (Gopalswamy 2006, p. 248) rather like slamming together two magnets the way they don’t want to go. Sometimes several CMEs will fly out over a few days, the first clearing a path through interstellar matter and speeding the transit of its successors. Each magnetic blast will, over hours or days, bend the earth’s magnetic field. This will accelerate electrical currents that flow at great heights above the planet, such as the “electrojets” that cause the Aurora Borealis and Aurora Australis. The gusts of solar weather will also strew turbulence in the earth’s magnetic field, like a strong wind over water (Kappenman 2005, p. 6), producing even sharper, if more transient and localized, magnetic oscillations across the surface of the earth. Scientists will declare the arrival of a geomagnetic storm. According to the laws of electromagnetism, when the magnetic field fluctuates in a spot, it induces a voltage there. The faster the magnetic change, the greater the voltage. Before the Industrial Revolution, electrical pressures induced by magnetic storms could only be relieved by the flow of electric charge through air, sea, or land. But now people have laced the planet with less resistive conduits: high-voltage power lines stretching hundreds of miles. Especially when crossing terrain whose (igneous) mineralogy resists electrical current—or when terminating near conductive seawater—and especially when the wires happen to align with the induced electrical force, these cables become geomagnetic lightning rods. Transformers exploit the symmetry of electromagnetism: just as a changing magnetic field induces a voltage, so does the movement of electrical charge (electricity) produce a magnetic field. Inside each transformer, two wires, one connected to the input line and one to the output, coil hundreds of times within or around a shared core of magnetically permeable material such as silicon steel. The normal input is alternating current (AC), like that in an ordinary home, its voltage flipping from positive to negative and back 50 or 60 times a second. The oscillating electricity in the wire produces an oscillating magnetic field in the transformer’s core. That in turn induces an oscillating current in the output wire, typically at a different voltage. The capacity of AC to be transformed in this way for low-loss, long-distance transmission is precisely why at the dawn of the electrical age AC beat out DC—constant, “direct” current—as the standard for power systems. In the worst case, argues geomagnetic storm expert John Kappenman, a storm would take out hundreds of high-voltage transformers across a continent-wide area. High-voltage transformers are large, expensive, custom industrial products. There are not a lot of spares around. New ones take months each to manufacture, and limited global production capacity could produce a backlog of years. The effects of a long-term blackout would cascade to all corners of industrial societies—pipelines, sewage treatment, police, air traffic control, hospitals. The scariest potential consequence is the loss of cooling at storage facilities for spent nuclear fuel, as at Fukushima in 2011 (Foundation for Resilient Societies 2011). What does the phrase magnetically charged mean? Did you mean electrically charged? Hi Ted, I mean “coherently magnetically oriented.” Or maybe just “magnetized”? So a magnet is magnetically charged but a regular piece of metal isn’t. The phrase actually is a thing–I just Googled it. Thanks for this information. I have become increasingly concerned about this risk over the last year or so, and having a trusted source delve into it and provide some explanation is very helpful. I’m happy to hear that the sentiments aren’t as end-of-the-world as I been wondering. 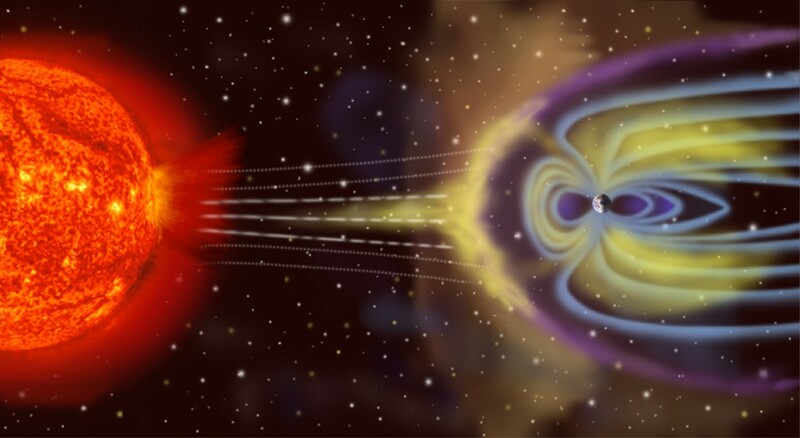 Would measures to guard against geomagnetic storms also serve to guard against EMP attacks? John, I think the answer to your question is “partly yes.” See http://www.empcommission.org/docs/A2473-EMP_Commission-7MB.pdf. Apparently electromagnetic pulses have three potential components, labeled E1, E2, E3, and E3 is most similar to CME-driven disruption. Ah, thanks. The matter/plasma ejected from the sun is magnetized. Hi Ted. I think it means the field inside the CME. So when this is strongly southward pointing, as discussed in the following post, it is oriented the same way as the field inside the earth. As you note the field inside the earth points south, opposite of what we experience on the exterior of the planet. And when the CME and Earth have parallel magnetic orientation, that is when the collision is most disruptive.